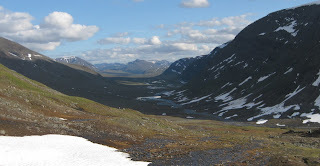 The King's Trail (Kungsleden) is the oldest and most well-known of the Swedish long trails. 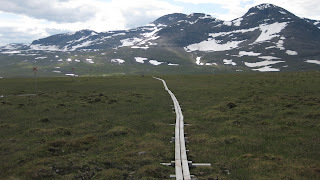 It consists of 430 kilometers of usually well-marked trail down the spine of the Swedish mountains, most of it above timberline, from Abisko in the north to Hemavan in the south. Jakob Sjölander Johansson, 18 years old, spent 18 days travelling this whole path unsupported. At the start of the trail, Abisko. 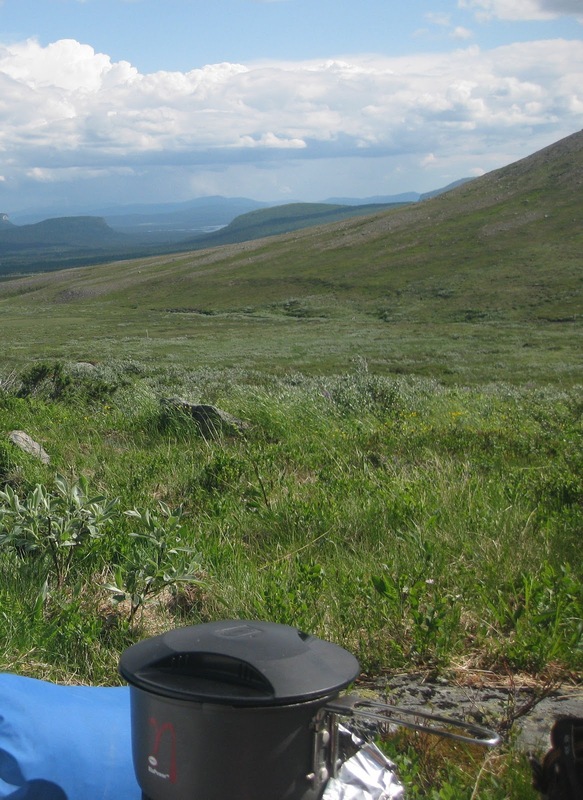 Q: How much did your pack weigh when you set out from Abisko in late June? Q: You brought all your food from the start. 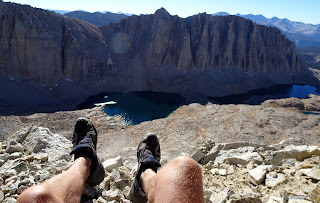 Why did you want to do this long hike unsupported? It would have been a lot easier to send food packages to towns and lodges along the trail. Jakob: I wanted to do this alone and dependent on no-one but myself. And... admittedly I did not know how heavy it would get when I made the decision. The “alone and independent” part failed too. There are too many people, cabins and lake-transports for that. Hermits beware. Q: Which was the most memorable part of the trail? Jakob: The part between Kvikkjokk and Jäkkvik. It is the least populated part of the trail, possibly due to there being fewer cabins. It took about three and a half days to get to Jäkkvik from Kvikkjokk and during two of those days I saw only two people. At the beginning of this section I was plagued by mosquitoes though, and towards the end the trail is poorly marked and also requires one boat transport. Still, I got two days where I could just walk. Q: Which were the major problems/obstacles you encountered? Jakob: The boat transports. At most lakes there are three rowing-boats, and while crossing the lake you must make sure that there is at least one boat on each side of the lake. If you are unlucky this means that you must first cross the lake, then tow one boat back from whence you came, leave it and then row back again. If the lake is, say, 4 kilometres wide as Laidaure at Aktse, that would mean rowing for 12 kilometres. I still have remains of a blister in my from doing this at Teusajaure. Of course, if there are two boats on the first shore you come to you only need to row once. Often there are people living at the lakes who can ferry you across in a motorboat, but this service is far from reliable. Or cheap. Still, you can't blame the people doing this. Or that is what I try to keep telling myself... The people who run the transports are the locals and one can't expect them to drop whatever they are doing just because another hiker has arrived and demands their services. Still, I lost quite a few hours to these boat transports. So much for “depending on no-one but yourself”. Q: What was the weather like? Did you encounter some severe winds or rain? Jakob: On occasion it rained or the wind picked up, but not much more than might be expected. 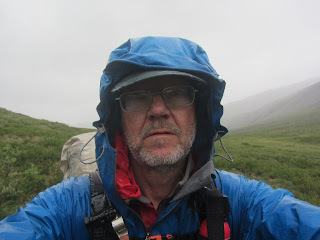 A thunderstorm in Aktse was the worst I saw, it was brief although it did cause some problems while crossing the lake. Of the two motorboat transports every day the last one had left at six o'clock, so I had to row if I wanted to cross Laidaure. Fortunately the weather improved a bit. 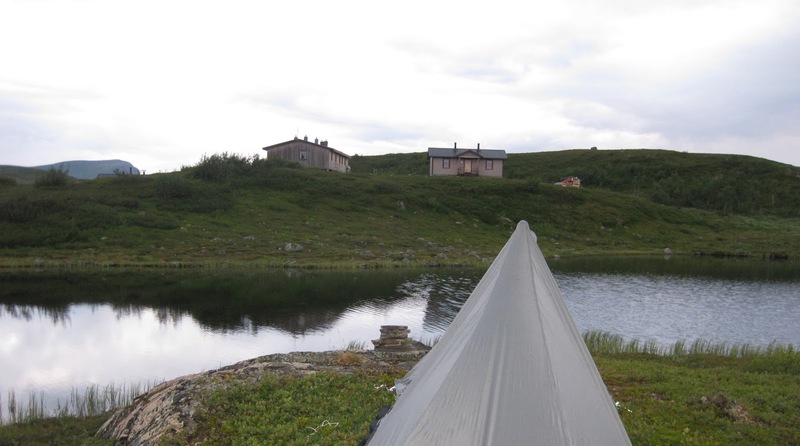 Q: You used a Tarptent Contrail as a shelter? How did this work, what did work well and what did not work so well? 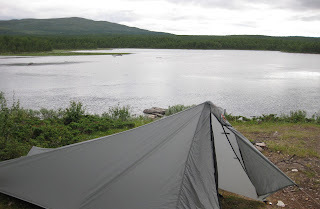 Jakob: I don't know much about tents so I wouldn't know what to compare it with. It kept the rain out. 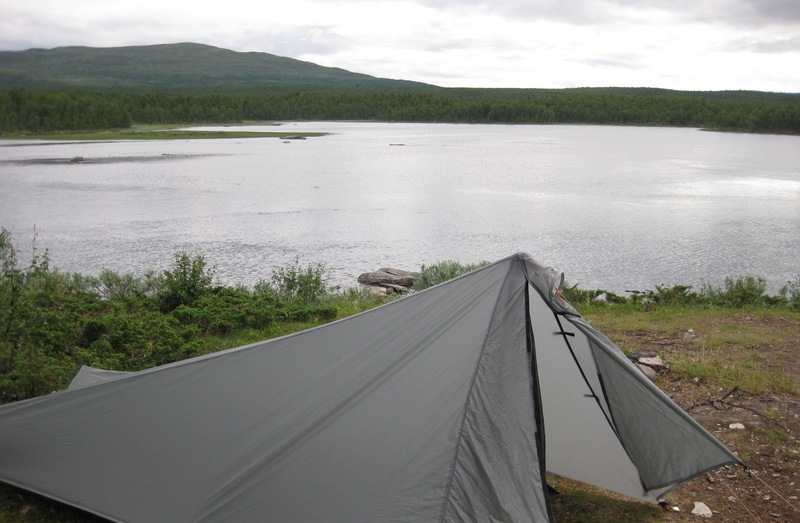 Q: The pack you used, a Gossamer Gear Mariposa Plus, was pretty full when you started out. The weight was around twice what the manufacturer recommends as maximum weight. How did this work out? Jakob: It worked. I had to strap a few shopping-bags on the outside of the pack for a week or so. But it didn't break. Q: You planned to use a homemade down quilt for sleeping but decided to take a sleeping bag instead and used a Western Mountaineering Ultralite Super? What did you think of this? What worked well and what did not work so well? Jakob: I tested the quilt before I left but decided to take a normal sleeping bag instead. I never managed to keep the quilt from leaking cold air around the perimeter. It might have something to do with the way I sleep. If you move around during sleep I found it would slip up and cold air would enter. The sleeping bag worked fine but I got a bit to cold for comfort on occasion, when it was windy. The Tarptent did not keep the chilling wind out. That might have something to do with it not being properly set up though. Q: What about cooking and eating? What gear did you use and what did you eat? Jakob: For cooking I brought a top-mounted canister stove, a Primus Micron. For breakfast I had a chocolate-powder drink and about 100 grams of muesli, both of which I mixed with cold water. For lunch I had rice, macaronis or tortellini. The rice and macaroni I mixed with 50 grams of beer sausage. For dinner at night I had ramen, also with a beer sausage. Q: You lost some weight during the hike. How much and how would you counter this should you do a hike like this in the future? Jakob: Before I left I weighed in at 65 kilos and when I was home again twenty days later I weighed 61, so I lost 4 kilograms. I quickly bounced back again though and I now weigh over 70. As to what I should do to avoid it in the future... I suppose eating more food would be a good start. At the end of the trail, Hemavan, after 430 kilometers. Q: I understand that before you left on your hike you read some books on lightweight backpacking, like Smarter Backpacking, Vandra fjäderlätt and Lättare packning från A till Ö.
Jakob: Yeah, I had to. My dad made me read them because he has written them. Nice! I can har the pre-trip discussion.. "27Kg? You don't want to do that! Here, read this book I've just written..."
I've noticed that the kids often need to do their own mistakes before actually believing dad is right. For my trip along the Nordkalottleden I started with 25 kg because wanted (and needed) to carry all my own food. The base weight was just below 8 kg. so I can relate to the 27 kg, which given the terrain at the beginning of the trip is not excessive. I am just glad I did not have to row a boat 4 kms (or more) I suspect that I would be still there. I agree with Peter (I remember it from myself). Laughed about the final answer =) Great! I'd be camping to wait for someone to fetch that other boat instead of rowing it three times. I would never have had the skills and ability to do a trip like that at 18y old. Adventurer in the making. Well done. This really made me smile: "Yeah, I had to. My dad made me read them because he has written them." I do not know about you at 18, but I would not describe Jakob as very experienced when he set out. 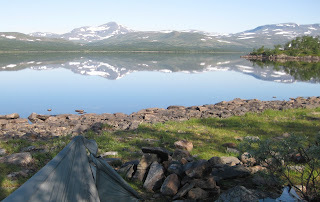 From that point of view Kungsleden is ideal, because it is long trail and quite an endeavour, but you are not far from people and huts should something happen or should you need a night inside to recuperate from whatever. I think 27 kilos is part of coming into manhood and proving, to yourself mostly, that you can hack it. Been there, done it. I think most guys have, although what you do is of course quite dependent on the company you keep and the values you have soaked up earlier.